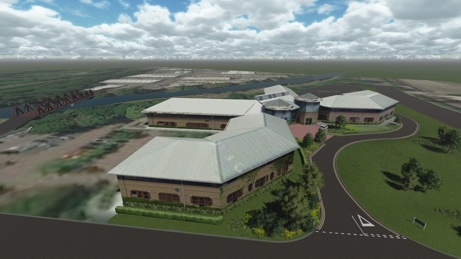 Eazyweb produced a geographically-accurate architectural visualisation of this out of town office centre. A simple mesh was modelled and placed in a geographically-accurate location map. The roads and pavements were then modelled in a photo-realistic manner, and the surrounding area was landscaped using a variety of modelled 3D trees and vegetation. The river to the rear of the property was modelled and filled with suitably dark Taff water! We also created the associated models, including all road signs, the structure at the entrance, as well as the bridge over the river. A 3D fly-through takes the user from the entrance, at street level, then progresses into the site, past the entrance to the building, and passes towards the rear of the building, at which point the camera takes flight and raises to produce a birds-eye view of the overall scene. This angle is good for giving a contextual location shot.